Tax law allows real estate investments to be included in traditional and Roth Individual Retirement Accounts (IRAs). However, various criteria must be satisfied for real estate investments to be valid IRA investments. Costly penalties apply if these criteria are not met. IRA investor interest in real estate has increased recently as dramatic stock market declines have prompted investors to look for ways to diversify IRA investment risk. Any type of investment real estate can qualify for IRA investment including apartment buildings, office buildings and motels. IRA real estate investments must be acquired by establishing a self-directed traditional or Roth IRA through one of three types of IRA trustees - an IRA custodian, an independent IRA administrator or an IRA advisor. According to The Wall Street Journal, initial account setup fees can range from $50 to more than $1,500. Annual fees range from $200 to more than $500 depending on the type of IRA trustee. The more "hand-holding" (advice, management, help with paperwork) offered by the IRA trustee, the higher the fees. IRA custodians offer no hand-holding and charge the smallest fees. IRA advisors provide a full range of services and charge the highest fees. To find IRA trustees, contact 1031FEC. Only cash can be placed into an IRA. IRA cash can then be used to purchase real estate, stocks, bonds, mutual funds or other investment assets. IRA cash can be rolled into a self-directed IRA from the taxpayer's existing IRAs or from certain corporate pension funds on retirement. When IRA real estate is sold, the proceeds can be reinvested in real estate or invested in other assets. Taxes are avoided as long as funds are kept in the IRA. If the IRA is a traditional deductible IRA, taxes are postponed but eventually paid. Taxes are permanently avoided for Roth IRAs as long as withdrawals comply with IRS rules. Typically, only taxpayers older than 59½ can make qualified IRA withdrawals. 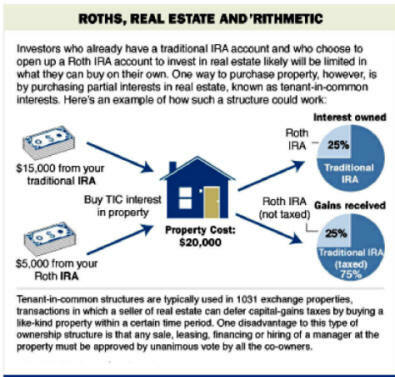 Because ordinary (not capital gains) tax rates apply to qualified withdrawals from traditional deductible IRAs, Roth IRAs are the best type of IRA for real estate investment. One of the primary benefits of using a Roth IRA is that you don't pay income tax when you withdraw funds in retirement. Unfortunately not everyone meets IRS standards to contribute to a Roth IRA. The primary reason individuals are not allowed to contribute is because their incomes exceed the Roth IRA income limits. The IRS has always allowed certain individuals to convert their Traditional IRAs to Roth IRAs as long as they met specific qualifications and paid income tax on the conversion. But high income earners were unable to convert until recently. In the past to be able to convert from a Traditional to a Roth IRA your income needed to be under $100,000. The IRS rules have changed and there is no longer an income cap in place. With the cap removed high income earners can now convert as long as they pay the appropriate tax on the conversion. There is no 10% early withdrawal penalty if the funds move from the Traditional IRA to the Roth IRA in a 60 day window. Why Convert to Roth IRA? Tax savvy investors want to pay as little income tax as possible. Converting to a Roth IRA allows you to make smart tax moves that will save money in the long run. If you anticipate your income dropping significantly in a certain year (and increasing in following years) then a conversion could be done in the low income year. Since your income is lower you may be in a lower tax bracket when you convert. Likewise if the government announced increase tax rate increases to go in effect the following year then a conversion in the current year would save income tax. Converting to a Roth IRA will guarantee you will owe no additional income tax on the converted funds during retirement. The balance in your portfolio will be what you can tap in retirement and you won't have to calculate an after-tax balance. Except for the Designated Roth Account, all income must be included as taxable in the year of conversion. Interested investors should do their homework before setting up a self-directed IRA to invest in real estate. If IRS criteria for self-directed IRAs and qualified withdrawals are not followed, combined penalties and income taxes can range from 15 percent to more than 100 percent of the real estate's value. Properties included in IRAs cannot be the investor's personal residence or purchased from immediate family. There must be enough cash in the IRA to pay annual property expenses (mortgage, repairs, maintenance) if the property does not generate sufficient cash flow. Additional funds can be rolled into the self-directed real estate IRA from other IRAs or certain corporate pension funds if necessary and tax criteria are met. *Financial Exchange and 1031FEC Consultants recommend that transfer of property be approved by a client's experienced business legal and/or tax advisors. This web site's "Investment" web page contains a partial survey of current available real estate provider properties. The properties may be subscribed before noted. Information is obtained from sources deemed reliable but not guaranteed. Investors should conduct their own independent due diligence and rely only on those results. Generic photos on this web site may not represent specific past, future or current 1031FEC client properties. **1031 Qualified Intermediary fees paid by the Party wishing to Defer Tax (Exchanger). Please inquire to 1031FEC for current USA property availability, required client qualification and fees at toll free telephone number 800.333.0801. Thank you. We Welcome You to Our Web Site. Thank you for Visiting 1031FEC.com.